Cut off the tips and cook very gently until just tender. Drain and cool; cover and refrigerate. Thinly slice the remaining stalks, discard any woody stems. Melt the butter in a large saucepan. Add the sliced stalks and the onions, cover and cook over a moderate heat for 6-7 minutes or until the vegetables are beginning to soften. Add the stock and parsley, season and bring to the boil. Cover and simmer gently for 30 minutes. Cool slightly. Puree in a processor or blender until quite smooth. Cool, then stir in the cream and season to taste. Cut six thin slices of brown bread and butter them. Cut off the crusts and halve lengthwise. Roll the reserved tips inside each piece of bread; place on a serving dish, cover with cling film and refrigerate until required. 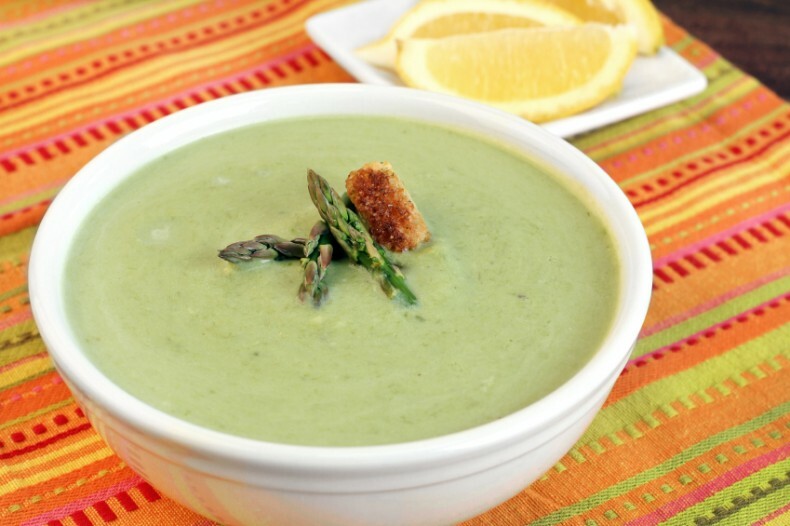 This soup can be served well chilled or hot, garnished with lemon and accompanied by the asparagus rolls.